The AD9520-0 provides a multioutput Clock Distribution function with subpicosecond jitter performance, along with an on-chip PLL and VCO The on-chip VCO tunes from 2.53 GHz to 2.95 GHz. An external 3.3 V/5 V VCO VCXO of up to 2.4 GHz CAN also be used. By Analog Devices, Inc. This is one package pinout of AD9520-0,If you need more pinouts please download AD9520-0's pdf datasheet. 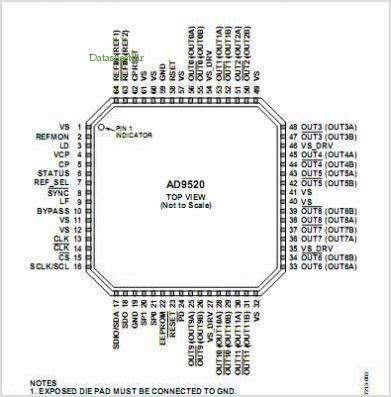 AD9520-0 circuits will be updated soon..., now you can download the pdf datasheet to check the circuits!